FUJIFILM announced a rangefinder style GFX 50R as the latest model in the GFX Series of medium format mirrorless digital cameras, incorporating a large sensor of approximately 1.7 times the size of a full-size 35mm image sensor (43.8mm x 32.9mm.). The GFX 50R will be released in November 2018. The GFX 50R produces ultra-high image quality by incorporating Fujifilm G Format Image Sensor with 51.4 million pixels, high-speed image processing engine X-Processor Pro, the high resolution FUJINON GF Lens, and Fujifilm's proprietary color reproduction technology accumulated for more than 80 years. Its lightweight and compact bodywith a minimum width of 46mm and a weight of 775g, makes the GFX 50R an ideal tool for snapshots, documentary photographs and portraits. Fujifilm introduced the GFX 50S as the first camera in the GFX Series in February 2017. With its compact, lightweight body and center viewfinder style, the GFX 50S proved popular among professional and high amateur photographers impressed with its image quality and mobility. While maintaining the same ultra-high image quality as the GFX 50S, the GFX 50R caters to the needs of photographers who wish to use a camera designed with a compact lightweight body and simple operability like a traditional film camera with the rangefinder style. Ultra-high image quality produced by the 51.4 million pixel medium format size G Format sensor and the high-speed image processing engine X-Processor Pro. It also incorporates Fujifilm's unique "Film Simulation” mode, which allows photographers to enjoy color reproduction of photographic films such as PROVIA, Velvia and ACROS used by professional photographers and hobbyists with traditional medium format cameras. Rangefinder style design, with a minimum width of 46mm, and light compact body weighing just 775g, provides superior mobility. Weighing just 775g, 145g lighter than the GFX 50S, the camera is easy to carry around and store, and also achieves superior mobility. The electronic viewfinder has a magnification of 0.77, and uses a high resolution 3.69 million dot organic EL panel. Accurate focusing is also possible even when shooting with the large sensor for medium format size, which has a shallower depth of field than the 35mm full-size sensor. Its strong magnesium alloy body is sealed in 64 different places to provide dust and weather resistant, and it is also capable of operating in environments as cold as -10°C. Its tough, durable body meets the needs of professional photographers. In addition, all of the Fujifilm GF lens are equipped with a resolution sufficient to handle 100 million pixel sensors and are designed for an extremely wide range of usage conditions, through dust and weather resistant, and capable of operating in environments as cold as -10°C, ensuring the camera can withstand the harsh conditions faced by professional photographers. A concept for a new flagship model capable of producing world-leading image quality with the world's highest 102 million pixels image sensor, a new GFX Series medium format mirrorless digital camera incorporating large sensor approximately 1.7 times the size of full-size 35mm image sensor which fully satisfies a diverse range of customer needs with high functionality including high-speed/high-precision autofocus, built-in image stabilization features, and 4K video shooting capability. The concept is to create Fujifilm's flagship model with highest performance and innovative features fully capable of meeting the diverse needs of professional and high amateur photographers. It incorporates the world's highest 102 million pixels image sensor which is larger than 35mm full size sensor, realizing world-leading image quality with Fujifilm's proprietary color reproduction technology accumulated over many years and ground-breaking mobility. Achieves world-leading image quality and superior mobility by incorporating the Fujifilm G Format Image Sensor with the world's highest 102 million pixels. 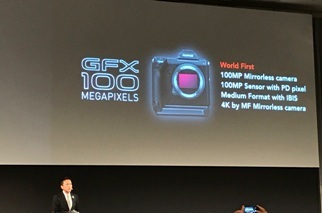 It is the first medium format mirrorless digital camera to incorporate phase detection pixels throughout the entire sensor (coverage ratio of 100%,) allowing for high-speed/high-precision autofocus wherever in the frame subject is located. Expanding the scope of ultra-high resolution photography through the world's first-ever built-in image stabilization technology to be incorporated into a medium format digital camera. Meeting the need for high-quality video production with the world's first medium format mirrorless digital camera equipped for shooting 4K videos. Light, robust vertical grip and integrated magnesium alloy body provides superior utility. It is the first camera in the GFX Series to have a vertically-position grip and an integrated magnesium alloy body, a design which makes the camera extremely robust, while also achieving good holding stability when attaching or removing large interchangeable lenses. Optical Viewfinder vs Electronic Viewfinder: Which is better? © Copyright. SAP Media Worldwide Ltd. All rights reserved.